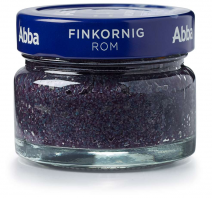 High quality black caviar with small herring caviar and balanced amount of salt. It is suitable for decorating of dishes, as well as for preparing sauces and delicacies. 100 g of product contains: energetic value – 320 kJ (80 kcal); 2 g fat (from which 0.7 g saturated fat acids); 3.5 g carbohydrates (from which 0.3 g sugar); 11 g proteins; 5 g salt.